Luis Suarez and Paulinho both scored twice in an emphatic win over Deportivo la Coruna. 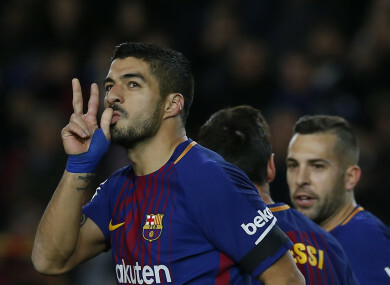 BARCELONA OPENED UP an 11-point La Liga lead over Real Madrid ahead of next weekend’s El Clasico between the Spanish giants as Luis Suarez and Paulinho each scored twice in a 4-0 thrashing of Deportivo la Coruna. Lionel Messi also saw a penalty saved and hit the woodwork three times as Barca regained their six-point lead over Atletico Madrid in second place. Real remain down in fourth, but do have a game in hand on their rivals as they missed out on La Liga action this weekend to win the Club World Cup in Abu Dhabi on Saturday. Messi paraded his fourth golden boot award for being the leading scorer in Europe last season before kick-off and could barely believe his luck as he failed to add to his 18 goals already this term. However, the Argentine still had a huge role to play in three of Barca’s four goals. Only a series of saves from Ruben Martinez to deny Messi and Aleix Vidal delayed Barca until the 29th minute from going in front when Messi presented Suarez with an early Christmas present to tap in from close range. Messi then smashed against the bar, but the woodwork wasn’t so forgiving for Deportivo when Messi’s next attempt came off the post and into Paulinho’s path to make it 2-0 before half-time. Suarez’s return to form continued as he netted for a fourth time in his last three games by sweeping home Sergi Roberto’s cross at the end of a sweeping Barca counter-attack two minutes into the second half. Messi hit the woodwork for a third time and then saw Martinez brilliantly save his effort from the spot after Suarez was upended inside the area. But Martinez was helpless as Paulinho profited from a repeat of his first goal when he rolled into an empty net on the rebound after Jordi Alba also hit the frame of the goal. Email “Ahead of next weekend's El Clasico, Barcelona moved 11 points clear of their rivals tonight”. Feedback on “Ahead of next weekend's El Clasico, Barcelona moved 11 points clear of their rivals tonight”.